1. In a large bowl, hand beat margarine and cream cheese until fluffy. 2. Add sugar and milk slowly until mixture is completely smooth. 3. In a food processor, add half the can of macaroons and process until the macaroons become crumbs. 4. Repeat step 3 for second half of can. 5. 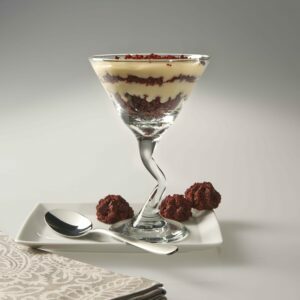 Place a thick layer of red velvet crumbs inside a trifle bowl. Top with a layer of frosting. Repeat this process until number of desired layers is reached or bowl is full. End with frosting layer, and top with red velvet crumbs.